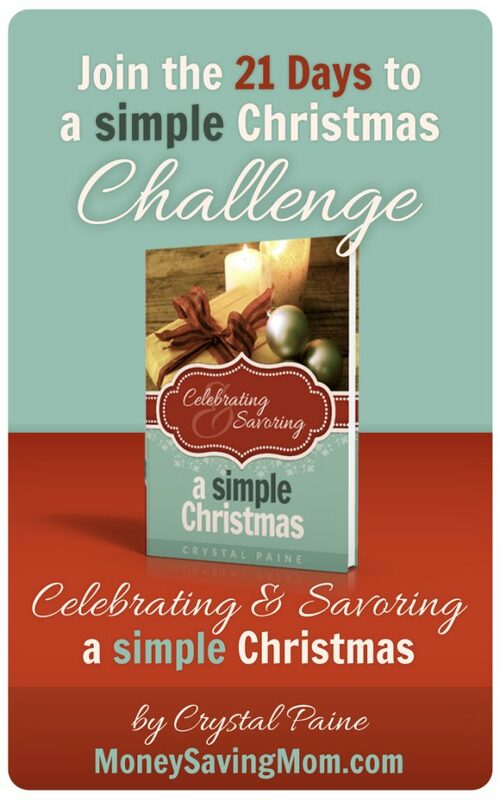 It’s Day 17 of the 21 Days to a Simple Christmas Challenge! 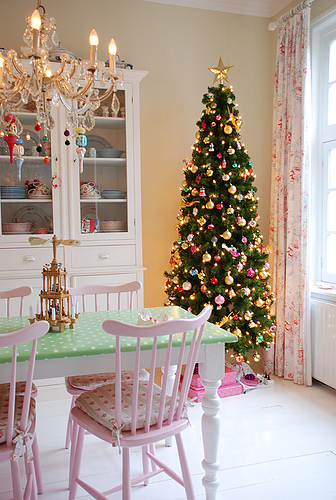 Christmas is almost here (can you believe it? ), so today it’s time to get our homes in shape for company or so that we can enjoy our family and not have to worry about stepping over dirty laundry piles or tripping on spilled milk. If you’re feeling overwhelmed by all you have to do, I’m here to help! 1. Start a load of laundry (3 minutes). 2. Set the timer for 15 minutes and take a laundry basket and a trash bag and go through each room in your home. Quickly straighten, pick up, and put away everything that’s out of place. Put all trash in the trash bag and put everything that doesn’t go in that room in the laundry basket (15 minutes). 3. Put away all contents in the laundry basket and throw out the trash (5 minutes). 4. Head to the kitchen and load the dishwasher or hand wash the dishes (15 minutes). 5. Switch the laundry from the washer to the dryer and start another load in the washer (2 minutes). 6. Sweep or vacuum your kitchen floor and wipe down your countertops (10 minutes). 7. Take some toilet cleaner and go squirt it in all your toilets (2 minutes). 8. Take some window cleaner and spot clean the main glass windows/doors/mirrors (3 minutes). 9. Take a dust rag and quickly dust in the main rooms of your home (10 minutes). 10. Vacuum all the major traffic areas in your home (20 minutes). 11. Head back to the bathrooms wipe down the toilet, sinks, floor, and bathtub/shower. Change the towels (20 minutes). 12. Switch the laundry from the washer to the dryer and fold the clean laundry (15 minutes). 13. Light a candle or simmer some potpourri on the stove and enjoy your freshly-cleaned home! A timer works wonders in helping me stay focused and work quickly. Plus, it makes it seem more like a game to see if I can finish my project before the timer goes off! It’s much more fun to work when you’re accompanied by cheerful, upbeat music. Don’t worry about the next thing on the list or your overwhelming to-do list. Just focus on the project at hand until the timer goes off. Then, move on to the next project. If your house is a complete disaster, it might need more than two hours. However, remember not to get too hung up on making it perfect. 2. Do as much of the Two-Hour House Cleaning Checklist as you can. 3. Come back tonight around 8 p.m. and share about what cleaning projects you accomplished today. I’ll share some pictures of our Christmas cleaning, too. I’ve loved this 2 hour cleaning plan since you originally posted it. It’s whipped my home into shape on more than one occasion. Merry Christmas! I’m so grateful — and Merry Christmas to you, too! I also liked that it works well with kids. I couldn’t do the whole 2 hours in 2 hours on the clock, but doing one segment at a time and then tending to my son in between worked great. Oh I should totally do the laundry basket thing too! I see something that’s out of place and when I take it back to the room where it belongs, I see something that needs to be done there and start in on that. Eventually I remember what I started out doing and go back, leaving two projects unfinished! Crystal: This is a great “budget” for housecleaning! You did a great job breaking things down into manageable bites of time. Sometimes we all just need an organized way of doing things shown to us so we can get things done, especially those of us who are unfocused and have a hard time getting started. Thanks! I’m going to follow you plan and check things off my list as I do. Thanks for your kind encouragement! I’m glad you found it helpful! Thanks for a great post! This will definitely help to keep me focused with a plan in hand! Merry Christmas to you and your family! Love your blog and have for about 3 years now! Merry Christmas to you, too! And thanks for your kind encouragement! I use this plan frequently! With a little bit of flexibility (laundry always takes me more that 3 min.) it is a perfect fit for me – thank you! But all kidding aside, thanks for the checklist. It looks great- just what I needed today! I love this checklist! I have been using it since you first posted it a few years ago. The one habit I have taken from it and used regularly is the laundry basket pick up method. My kids and I make a game of finding things that don’t belong, and then putting them home. Thank you so much for this! Amen to that! Little kids and a clean house do not go hand in hand for long! Such a great, concise cleaning plan that hits all the main points. Sometimes it’s so easy to get distracted by all the little details that most people wouldn’t notice anyways 🙂 This is a great checklist for cleaning the house even just during other parts of the year. Thanks for the list! I have printed this 2 hour house cleaning plan and used it when things have been crazy and my house is overwhelmingly messy and I can’t figure out where to start. Sometimes it’s helpful just to have someone tell me what to do step by step. Thanks for having it available! Haha, we all need a mom to tell us what to do once in awhile! This new checklist is prettier and on one page instead of two! I still occasionally use the old one when I’m in a rut and tired of my usual checklist. This one will have to get covered with contact paper so I can re-use it with dry erase crayons. Thanks! It’s just what I needed. steps 2 & 3 would take me an hour by themselves. as for step 1, I would have to do more than 1 load of laundry to make any sort of dent in it. I was thinking the same thing- that would take an hour or two by itself (steps 2 and 3). One thing I have done though is just go around and put stuff out of place in laundry baskets (yes, more than one may be necessary). Then put those baskets in a closet until you have time to put things back in their proper homes and then spend the rest of the time cleaning. Even with big messes, you can probably have everything put in laundry baskets in 20-30 minutes at the most. I have done this before gatherings when I needed to clean quickly. I was actually very pleased with how quickly it went with this method. I thought for sure it would take a lot longer than it actually did. And if it takes longer, that’s okay too! I’ve been in the kitchen for the last week baking, and the rest of the house has gotten away from me. I’ve managed to get three loads of laundry done so far. I just squeezed in more laundry since it was taking me longer than the allotted time anyway. Plus I look forward to using this method as a tool to stay on top of things twice a week, so it won’t get ahead of me like it has this season. Thanks, Crystal! One more strategy that helped me and mine, thanks for sharing from you and yours! I can’t even begin to tell you how much I needed this today! Due to a busy week and some last-minute deadlines, my house is a disaster. I was dreading going home and cleaning tonight! This gave me a fresh look at it, and two hours for a clean house is totally doable. Thanks! You are so welcome! I’m cheering for your success! Doing the pre-company clean today. I break it down over a week starting with the least used rooms and work my way to the most used areas at the end of the week. Today I finished the upstairs. Tomorrow the kitchen and the main bathroom. Little boys and bathrooms yikes! I keep a toy container in just about every room, so when I say clean up we just toss things in the nearest container and sort another time. Kid clutter is killer.